and many more opportunities await! Cub Cabin is a dry cabin, with no running water. Rustic quaint log outhouse beside the cabin. Experience the old Alaska charm. Full bed with twin trundle underneath. Dorm size refrigerator, microwave, coffee maker, and 5 gallon water cooler available. Internet available. Cell phone service in the area, but not at the cabin. Outhouse equipped with a light, reading material and whimsical paintings. We, Chuck and Brolene Gerwig, have lived in the community on Victory Road for 23 years, in fact we met while working at Victory Bible Camp at the end of the road! It has been a great place to raise our 4 kids! After having worked at the camp for years Chuck started a construction business in the Glacier View Community, building log and frame houses, remodeling, plowing snow, and little bit of everything! He has had the opportunity to snowmachine the Iditarod trail, helping to film the 2004 Iditarod Dog Sled Race. In 2014 he was featured on Building Alaska. The log home he and his crew built sits beside the Matanuska Glacier. Brolene has so enjoyed raising the kids with this incredible nature right outside our door. She tries to keep up with all that Chuck does, and each week does a day of school nursing in 2 small local schools. The family has been blessed to hunt, snowmachine, 4 wheel, canoe, kayak, and hiked in the area. You don't need to go far to be astounded with the views! We bought this property in the fall of 2014 from our dear neighbor who lived here for 36 years. She and her husband bought this, one of the first cabins built on the road, and turned it into their gracious home, which welcomed many over the years. Now we welcome others to come experience the Glacier View area with its beauty and charm. Coming to the Bear Den Cabins’ Cub Cabin opens up the chance to experience the rural mountain setting of Glacier View, Alaska. Mountain hiking, canoeing or kayaking at Long Lake, Weiner Lake, or the lakes up the road, glaicer hiking on the Matanuska Glacier, white water rafting on the Matanuska River, all are just minutes away. Several local lodges and Cafes are nearby (10-20 miles). Many things to do. Or just rest in the tranquil quiet of the country road community. Come enjoy it! Located in the quiet, small community on Victory Road off of the Glenn Highway, 50 miles NE of Palmer, Alaska, and 100 Miles West of Glennallen. We are 10 miles from the beautiful Matanuska Glacier. We are nestled between the Chugach Mountains and the Talkeetna Mountains. The view from the living room is the gorgeous 6000 foot + peaks of the Chugach, snow capped all year round. Beautiful lawn in front of the cabin with mountain views! It's really nice place to stay 1 or 2 days. little bit difficult to find from the road. Very nice and helpful people in case of any questions and doubts. 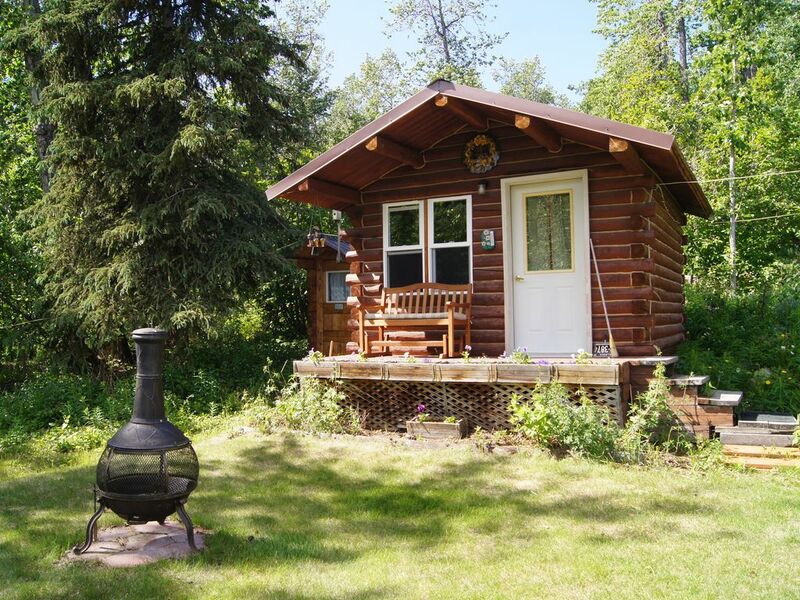 Lovely, well kept, friendly cabin with plenty of amenities . We enjoyed our stay immensely. The owners are helpful & kind. The cabin is small, but mighty. There is a microwave, coffee maker & frig. The outhouse is clean & adorably decorated. The flowers are beautiful. We truly enjoyed our stay! Thank you!! Great to have you!! Hope your trip way up North went well!! We loved our weekend stay in this adorable cabin. It is so warm and cozy! Lovely spot, and plenty of space. We played bocce ball in the large grassy yard, and we never saw a mosquito! Even the outhouse is nice. We will be back! A wonderful, quiet and cute cabin off the beaten path. This is a dry cabin so with that said it was a well kept and makes for a cozy night! It has a small fridge, microwave, table and a nice heater! The outhouse is very nice and actually pretty funny (decorations)! My husband has a bad back so he had a rough night of sleep... but he needs a firm bed (Not everyone does) and there were plenty of blankets. We met Brolene and one of her sons who were very pleasant and informative. Thanks again for a great place to stop! We had a wonderful time on our romantic getaway! The cabin was perfectly cozy and accommodated all of our needs! The bed was very comfortable and easy to get a goodnight sleep to be well rested for the glacier in the morning! There were a few nice restaurants only a short drive away but also plenty of storage room in the cabin for all of our snacks. The wifi was hard to connect to and stay connected to but i think that is the point of renting a cabin in the woods! It was the perfect little escape from reality for our overnight trip! Thanks for letting us stay! We are just minutes from the majestic Matanuska Glacier, the only glacier accessible by road. Several area businesses offer guided Glacier hikes, flight seeing, and rafting. Summer wildflowers abound right out your door. Our area is known for the incredible fall colors in early to mid September. You will be astounded at the golden autumn leaves surrounding you. Then in the winter come look for the Northern Lights out your windows. What a breathtaking area!! Come visit us!